The Garmin Drive 50LM is a car satnav with Lifetime mapping. There are two models available with either UK and Ireland maps or Eastern and Western European maps. The satnav also includes dual orientation mode with a 5-inch screen. Drive awareness features are also included on the satnav such as Driver Fatigue Warning, School Zones, Dangerous curves and speed changes. Please note: If you would like traffic information on your satnav you should consider the DriveSmart range of Garmin satnavs instead of the Drive series. Garmin Drive 50LM has been discontinued. The Garmin Drive 50LM is a car satnav with FREE lifetime maps. There is a choice of either Uk and Ireland or Western European maps. The screen size is 5-inches and you can use this Garmin satnav in dual orientation and the device knows when it has been rotated and adjusts to display horizontally or vertically. The Garmin Drive uses Real Directions whereby it uses landmarks (buildings, traffic lights, etc.) to guide you by voice instructions. If you would like traffic information, voice-activated control of your satnav and bluetooth you should buy a Garmin DriveSmart satnav instead of a Drive satnav. Foursquare Points of Interest are also included offering millions of POI's. Additional POI's include speed camera and red light cameras. Up Ahead feature also suggests places to visit along your route without leaving the map view. Real-time information includes weather via a mobile app. Active Lane Guidance with voice prompts at every exit or junction helps you navigate busy junctions. Brightly coloured arrows on screen also help to show you the way. Birds Eye Junction View provides an overhead view of junctions and PhotoReal Junction View also provides photos of junctions along your route (and surrounding landscape) so you can recognise where you are. You will also be alerted to sharp curves, speed changes, railway crossings, animal crossings, school zones and if you drive the wrong way up a one way street you will receive notification on screen. The battery life is upto 1 hour. Fatigue warning suggests break times and possible rest areas along your route. The Garmin Drive is compatible with the BC 30 wireless backup camera (sold separately) which allows you to see behind your vehicle so you will not miss vehicles, pedestrians and other obstacles as they will be displayed right on Garmin's display (as you are reversing). Another useful optional extra accessory is the Garmin BabyCam which you can install to view a baby in rear of car direct on the Garmin sat nav screen. The Garmin Drive 50LM includes everything you need to mount and install it in your car. Included when you purchase from ActiveGPS is a Vehicle Suction Cup Mount which is used to mount the satnav on the windscreen - simple, quick and easy. 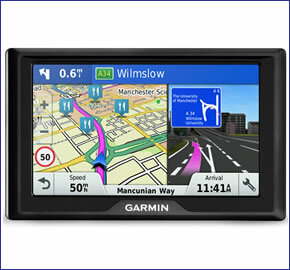 Garmin Drive 50LM is preloaded with City Navigator NT maps for the UK and Ireland or Western Europe provided by here maps. These maps can be updated FREE for the life of the product, when you register your Drive with Garmin UK. Further Garmin Drive maps are available on SD card which insert directly into the Garmin Drive. Available Garmin Drive maps include North America, Australia and New Zealand, Middle East and Southeast Asia. Looking for accessories and spares for the Garmin Drive 50LM? Accessories available to purchase include a 5-inch carrying case, vehcile power charger, a weighted dashboard mount and a vehicle reversing camera. Along with these accessories, it's also possible to buy replacement parts such as suction cup mount and vehicle charger. The Garmin Drive 50LM are both preloaded with street-level road maps for the UK and Ireland or all of Western Europe. If however, you want to take the Drive 50LM further afield, we may have the map that you need. Garmin Drive 40LM include: USA, Canada and Mexico, Australia and New Zealand, Morocco and Southern Africa. Do you have a question about the Garmin Drive 60LM? Submit your question via our contact page.